Have a few gray hair in your brows? Or maybe a few bare/wimpy patches? Or perhaps your brows just need a little "oomph" early in the morning - but you don't have more than a minute or two to spend on them. Billion Dollar Brows Hint of Tint is one of the best new finds to not only offer color and shaping - but all day control with the ease of a mascara wand-type application. Since I have darker brows, I tried the Hint of Tint Taupe (there is also a lighter color for those of you with blond/light brown or red hair). The brow gel was light, creamy, and very pigmented. It covered my brows very easily and with only a light touch of the wand. The color that filled my brows in was very natural looking and did not dry out, smudge, or flake during the day. 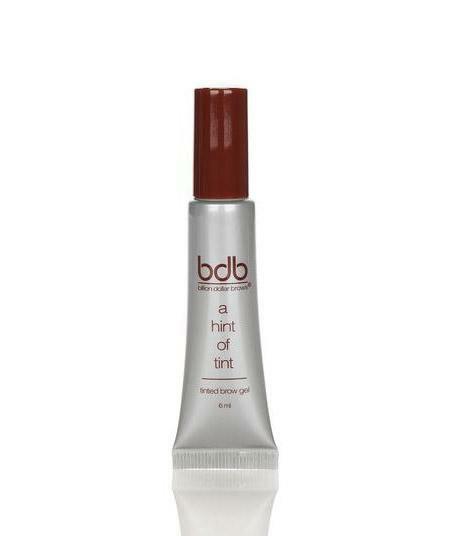 It kept my brows tamed and in place without them feeling "glued down" or stiff (pet peeve of mine!). The is the perfect product to bring for easy travel beauty routines, or giving yourself a touch up at the office before heading out for the night. This is so quick and easy to apply it's going to be a makeup bag staple for me now. *This product was provided courtesy of Billion Dollar Brows PR for reviewing purposes.